Ever-sophisticated and enduringly chic, black is and will always be a home design darling. There’s hardly a shade out there that’s more versatile, especially when paired with its favorite partner, white. 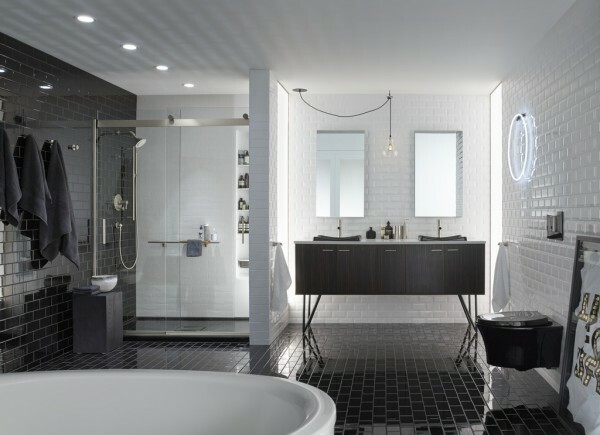 Black works beautifully as a go-to hue for the bathroom, whether your style runs toward classic elegance, sleekly contemporary, or somewhere in between. Here’s a trio of black bathrooms to start you dreaming. For those seeking a stronger design statement in a traditional-style space, a mostly black color scheme quickly pushes softer neutrals to the wayside. A variety of paint sheens, glamorous touches of marble, displays of mirrors, and purposeful lighting balance the weight of dark walls for a look that’s classic, but never boring. Add interest to all-black walls with classic details like wainscoting and decorative moldings. A vanity with legs, in contrasting white, creates an elegant furniture-style focal point. Faucets and accessories in brushed bronze add shimmer and sophistication to an all-black palette. Love this look? 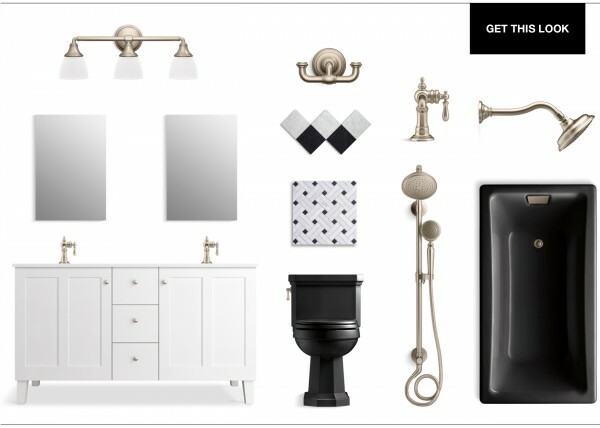 Explore our Manor House Black Bathroom moodboard. The classic combination of black and white is always in fashion, and instantly adds drama to any space. No matter the medium—fashion, art or interior design—black-and-white is a go-to color scheme. This bath incorporates some fun nostalgic elements for a look that’s brimming with personality. Don’t hesitate to add collections of beloved objects like glass bottles, framed art and other items to personalize your space. 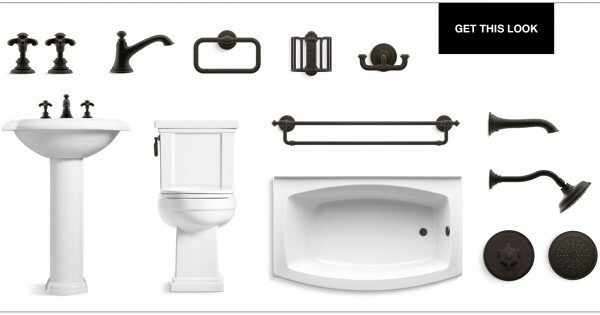 Keeping faucets and accessories in the same finish family, like a rich oil-rubbed bronze, will help unify the look. Stick with classic-style faucets and fixtures, and add decorative objects and textiles to change the room’s look. Love this look? 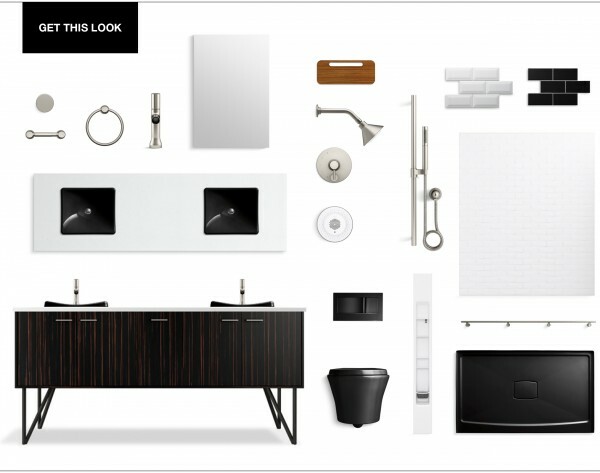 Explore our Pavilion Black Bathroom moodboard. The best contemporary-style bathrooms pay homage to minimalist design without going too starkly modern. Wood details help warm things up. And simple furnishings like wall-hung vanities and toilets and freestanding baths contribute to the openness that helps make this trend so popular. Choose materials with different reflective qualities to focus the eye and create depth. Stick with angular, geometric shapes and simple forms to keep the look clean and modern. Conquer clutter with a vanity that stores everything you need behind closed doors. Love this look? 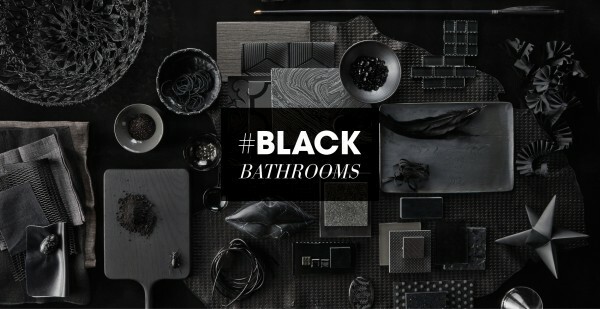 Explore our Brooklyn Black Bathroom moodboard.